the time of the incident depicted in the monument. Occupation: Storekeeper in Mountville according to 1860 Census. Storekeeper in Millersville until store burned down 1858. Before leaving Lancaster with Col. Hambright's regiment, Corporal Elias H. Witmer arranged to write letters for publication in the Daily Evening Express, Lancaster's only daily newspaper. The fifty or so letters he wrote approximately every other week over a two-year period beginning in October 1861 describe for a general audience the significant and insignificant events in the life of the regiment. As a soldier who wielded a semicolon as proficiently as a Springfield musket, Witmer played an important role for anyone in Lancaster interested in the regiment, and we get the sense the letters were eagerly consumed and given weight in Lancaster. In Oct. 1855, Mr. Sneath married Elizabeth Witmer, who was born in Manor township, Lancaster county, daughter of Hon. Daniel W. and Anna (Hershe) Witmer, granddaughter of Daniel and Elizabeth Witmer, of Manor township. Daniel W. Witmer was a prominent farmer of Lancaster county. He served for three terms in the Pennsylvania House of Representatives, and in his later years was a merchant and drover in Mountville. He married Anna Hershe, daughter of Abraham Hershe, an old resident of Lancaster county, and to them were born the following children: Benjamin A., deceased; Mary, who married David H. Wideler, of Mountville, and is now deceased; Elizabeth, wife of Mr. Sneath; Elias H., who was a soldier of the Civil war, wounded in battle and is now deceased; Abraham, who served as lieutenant in the Civil war and is now deceased: Jacob H., a bank clerk at Mountville, Pa.; Kate, wife of Levi Myers, a tobacco merchant of Lancaster; Harry C., a merchant at Lancaster City; and Sarah, who died young. Daniel W. Witmer, the father, died in 1896, aged eighty-eight years; his wife in 1870, aged sixty years. She was a member of the United Brethren Church, and both are buried in Mountville cemetery. 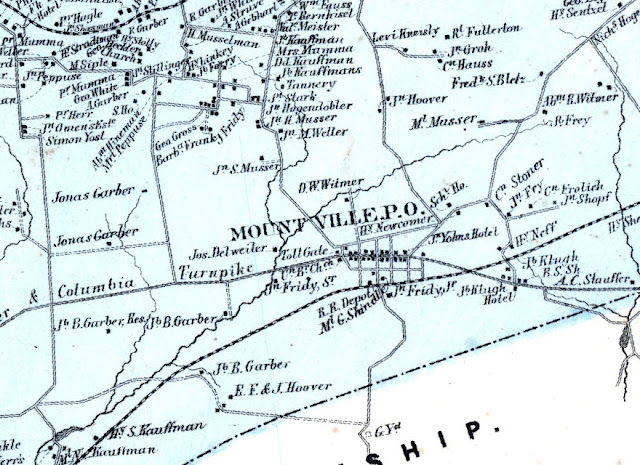 Detail of West Hempfield Township Map from 1864 Bridgens AtlasD. W. Witmer residence can be seen just north of Mountville. I intend to post all of Witmer's letters on this site 150 years after the day they were written. You can view his first letter, an index of all 79th PA soldiers' letters, and all posts tagged "Elias H. Witmer." The letters provide invaluable insights into the regiment's events, morale, and attempts to form a cohesive identity. I get the sense they were eagerly consumed in Lancaster and provided a valuable function to anyone at home with connections to a soldier in the 79th Pennsylvania. One can only wonder of the somewhat awkward social pressures that came with writing a letter from camp on behalf of a couple hundred soldiers, having the letter be published and distributed, and then having all the soldiers reading the letter about their own lives when the Express made its way to camp. In 1863, Witmer took a fierce Unionist turn in his letters, castigating anyone he viewed as hindering the war effort. Witmer even took the opportunity of a furlough in May 1863 to give a Union League speech in Mountville to continue his scorn for "Copperhead" Democrats in person. 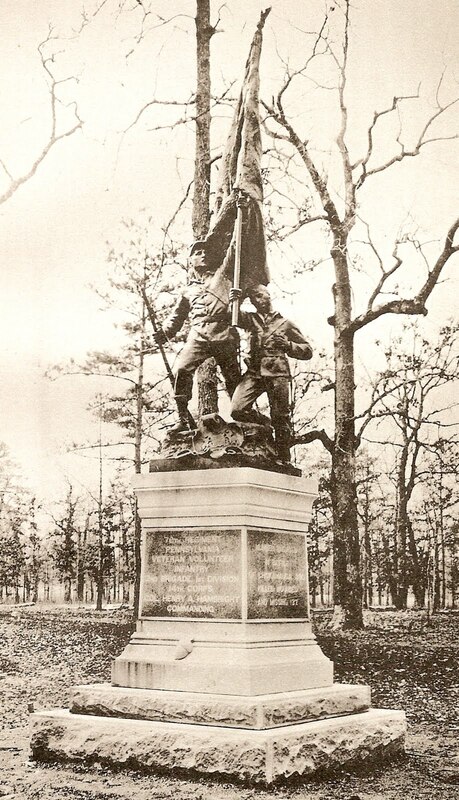 We also know of some teamwork in March 1863 between Capt. William McCaskey, his brother J. P. McCaskey (then a principal and activist in Lancaster), and Witmer that resulted in Witmer promising to "give a little thunder" to confront a rumor in his next letter to the Express.